A video is considered viral when its popularity shoots and thousands upon thousands of people are watching it, sharing it and talking about it to other people they know. There could be a whole number of reasons why any particular video goes viral – but the main cause behind it is that the video is shareable. For whatever reason, people are deciding to send the video to their friends, who send it to their friends and so forth, racking up thousands upon thousands of views and making it famous… or infamous. A videos chance of going viral is unpredictable and it’s almost uncontrollable, but there are efforts you can make that could increase your chance of a video going viral. The video might be considered shareable because it’s funny, topical, amazing, nostalgic, scary or just because it makes people want to show it to others. Obviously, this kind of attention and popularity can have an amazing effect on a business – which is why many companies have set out to try to make viral videos of their own. Old Spice has had no end of success with their videos, and it’s unlikely that you haven’t seen or heard of Evian’s baby&me video. So what can you do to help your videos go viral? Depending on your outlook, this could either sound really easy or super difficult. Like already discussed, viral videos become popular because their shared around a lot – there’s a reason why they’re shared. If you were any random person, would you want to share your businesses video? Is there anything about it that makes you want to show it to other people? Is it interesting? Is it thought provoking? Is it funny? Viral videos don’t always have to contain a message. 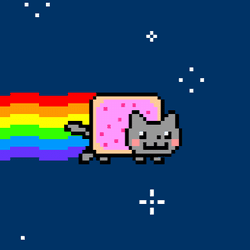 Take a look at Nyan Cat. It’s one of the most well-known videos on internet but there’s no meaning behind it. It’s popular because it’s funny and cool. There’s nothing special to understand about it. A lot of companies’ viral videos are similar – they might not even be related to their product. Introducing The Guardian and Observer Weekend barely even mentions newspapers but has proved popular regardless. Another example of a business getting a viral video right is Dollar Shave Club. They made a great, down to earth video – Our Blades Are F***ing Great – discussing exactly why their product was so good and it proved to be a massive hit. Many videos have gone viral because they’ve involved the viewer’s emotion in some way. The whole of the KONY 2012 campaign, which you might remember was a big deal on the internet early last year, was based on this. That campaign exploded overnight due to how it reached out to the viewer and before long it was being shared everywhere. Internet Explorer has also made a viral video using emotion – this time nostalgia. Their Child of the 90s video has reached 45 million views despite only briefly mentioning the browser at the end. This video by GREY SPAIN was probably never even intended to go viral but has generated 8 million views regardless, most likely because of the thought provoking content. One of the reasons the Blair Witch Project was so popular was the style in which it was filmed. The shaky, handheld camera made the movie feel more realistic, as if the events in it actually happened and were documented by real people. It was such a success that it was later used by other films with less realistic themes but similar feeling results (Cloverfield, Paranormal Activity, Diary of the Dead). You can take something from this when thinking up your video idea. This video (content may not be suitable for everyone) for a song by the band Biting Elbows is filmed entirely from a first person perspective. This is cool, new and different – the video had a lot of publicity and most of its 15 million views are because of this. Pepsi were also trying something different with Test Drive, which involved a professional stock car driver and an unsuspecting car salesman. It was effectively just a prank, but is currently on 38 million views. Some of the best viral videos feature ordinary people that had no idea they were going to in a video. Their real life reactions can have all kinds of consequences and make a great video which people will share around. Take a look at the video above (Stresstest by Nivea) or Best Bus Stop Ever by QUALCOMM, both featuring people who have no idea they’re being filmed till they’re already part of it. These videos are popular because they’re funny and relatable as they use standard ordinary people who just happened to be in the right place at the right time. They’ll often be shared around because people wish something like this would happen to them! Despite your best efforts, there’s no way of telling whether or not your video may hit it off. The best you can do is attempt to increase your chances by creating a video that could be considered shareable, and perhaps working to promote it yourself.